Online, many people were quick to cry “ah! millennials! bad!” (I’m paraphrasing, but you get the idea) about the selfie-filled image. “Hillary Clinton waves to the ‘look at me’ selfie generation,” tweeted one Twitter user. 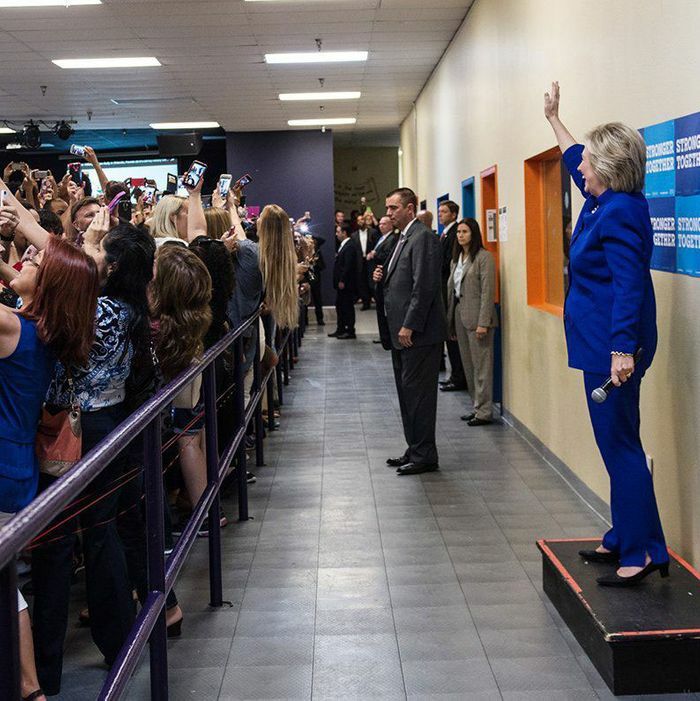 “Crowd turns its back on Hillary Clinton as photo captures the age of the selfie” reads a dramatic headline from The Telegraph regarding the picture. Except, the supporters were only obliging Clinton’s request. The selfie was her idea, Barbara Kinney has since explained. Kinney said Clinton stood up on the podium and said, “Okay everybody, turn around and we’ll do a group selfie,” before making the staffers standing next to her move out of the way so each side of the room could take an aesthetically pleasing photo. So maybe the supporters in the picture were nothing more than a bunch of selfie-thirsty millennials hungry for Instagram likes. But hey, Hillary asked. It would have been rude not to take a selfie.